This unusual clock consists of a stainless steel hub and similar radial bars mounted on clear see through glass. This clock, elegant in its simplicity, looks fantastic and matches almost any room design. It is 39cm in diameter (15¼ inches approximately) and offers great value for money. 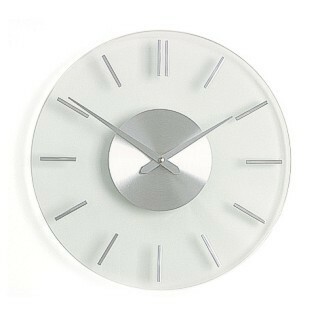 The glass dial has metal clock hands and bevel ground edges for a quality finish.